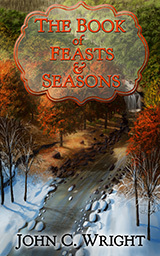 John C. Wright’s latest offering The Book of Feasts & Seasons is precisely that—an offering, not of blood but of ink, a tinsel-wrapped gift presented to both his God and his readers. A couple of stories in the collection are about as heartfelt and beautiful as anything I’ve read, since, well, Awake in the Night Land. Wright finally even managed to make me shed a few manly tears. Ok, actually, several manly tears. With this collection, Wright proves himself the master of the rapture; there are few others out there even attempting what he’s doing. I think it important to briefly explain, in my estimation, precisely the literary hole in the modern heart that I believe Wright fills. It is commonly said that people read science fiction or fantasy to escape. If that is the case, we are jumping out of the frying pan and into the fire – because most of what is out there isn’t an escape so much as it is a mirror to our modern Moloch madness. The Sci-Fi/F of the modern age offers only what the modern age can offer: more nihilism, more political correctness, and more distraction from the drudgery and perpetual boredom of a bureaucratic society. If the modern man, poor beggar that he is, will not or cannot find the alms for his impoverished soul, and refuses to fall to his knees or trod into a sanctuary, perhaps a science fiction and fantasy book can help to point him in the right direction. This is precisely the effect that Wright arouses in me. He invites his readers into the transcendent, and in so doing calls other authors to once again inspire, uplift, and become a beacon of spirit. Now, The Book of Feasts and Seasons accomplishes this feeling of awe in nearly every story – and the ones that don’t inspire awe at least inspire feelings of wistful whimsy, and a couple guffaws. The collection has a lovely rhythm, moving as it does through the annual Catholic calendar: each of the ten stories corresponds to a different holiday. You can enjoy them as you would an advent calendar, relishing each story slowly, at the appointed time, enjoying each seasonal and thematic flavor of Wright’s narrative confections; or, you can just engorge yourself on the whole lot as fast as possible. With as many time travel stories as there are, I happened to follow the latter scheme. The book begins with New Year’s Day and the amusing “The Meaning of Life as Told Me by an Inebriated Science Fiction Writer in New Jersey.” The gimmick is more or less that all time travel stories are real – H.G. Welle’s invented the time machine, Marvel’s Sis-Neg created the universe, and Keith Laumer’s Nexxus time wardens are all cleaning up all the paradoxical mess. Regrettably, Marty McFly does not make a cameo. Still, it’s great fun. Wright has the extraordinary ability to throw weird disparate elements together into the same story with the relish of a mad scientist and somehow make them all gel together. “Queen of the Tyrant Lizards” is no exception: Ku Klux Klansman, a Cretaceous dinosaur, and a Schrödinger’s Cat Cloud all make an appearance. The story is Wright’s answer to and appropriation of “If I Was A Dinosaur, My Love”, and since it’s way better—in style, imagination and structure—I expect it to be nominated for a Hugo. It’s only fair. My favorites were “Pale Realms of Shade”, about a psychic investigator turned ghost, and “Nativity”, about a time travelling widower who encounters the infant Christ. Both gave me the aforementioned man tears. The stories in The Book of Feasts and Seasons point towards the stars and say “the best is yet to come”, and I suspect the same is even true of Mr. Wright’s works. I can’t wait! I will forever love the image of the Archangel Gabriel, a being of pure light, booming “Confess!” in a louder and louder voice to the terrified main character. That was funny. There’s a lot of memorable images. I especially loved his visionary apocalyptic descriptions of the invisible realms – the way he’ll impressionistically throw a flurry of images and symbols at you all at once. Trippy. That sense of awe and purpose readers seek in quality fiction is indeed hard to find these days. Too often, all we can find is the pre-digested, politically correct echoes of pink sci-fi. Such a literary diet fails to nourish. It’s a slow death by rabbit starvation. I wish this was available in hardcover it paperback. I have a lapsed Catholic in my life who would surely benefit. Plus such a perennial work deserves it.